While the museum has been closed these last couple months, we’ve been hard at work on getting ready for the upcoming season. Among the many great fun and educational programs and events is our annual temporary exhibit. 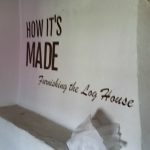 This year’s temporary exhibit is called “How It’s Made: Furnishing the Log House.” This Log Blog post will look at the process that went into planning the exhibit—a how it’s made of How It’s Made. The exhibit was partly inspired by probate records, which show an unparalleled look into the things that were in people’s homes at the time of their death. 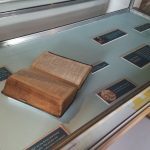 A nother inspiration was the fact that while very often people see objects in a museum, they rarely hear about how they would have been made—an experience which would have been very different for people living here in the Log House in the eighteenth century. The collection of eighteenth and nineteenth century domestic items that housed at the Morgan Log House is very expansive, including many examples of textiles, furniture, books, and ephemera. A set of criteria was selected for the objects: they had to tell a story that connected the Morgan Log House to the wider world and they had to have a connection to the modern day. Choosing objects is the hard part of the exhibit—it’s where part of the curating comes in. The boundaries of the historical story that you want to tell with an exhibit are set based on the objects that are inside. “How It’s Made” tells a story of domestic life, but domestic life for the families that would have lived here. Farm tools are there: the site was a working farm. A Welsh Bible is there: the people living here were Welsh. edited, resulting in readable panels, which were informative enough to be interesting but not too long—because no one has hours to stand in a gallery reading a book! Installation is the last (and, maybe, the most fun part), because all the planning—the research, the writing, the designing—come together into a finished product. With some adjustments, the exhibit is then ready for the public to enjoy! “How It’s Made: Furnishing the Log House” will be open to those visiting the Morgan Log House from April through December.